If your client wants one he would buy an empty plane and it would be custom built into a VIP aircraft for him. The BBJ 747-8 is the largest bizliner available and can fly between practically any two cities in the world. Owning a private jumbo jet is also a large status symbol and nothing will match a BBJ 747’s ramp presence. The cost of owning and operating a 747 is enormous – but people who can afford one are not likely to be put off by the operating costs. The BBJ 747-8 is capable of flying 100 passengers up to 8,875nm (16,437km) – far enough to pair almost any two cities in the world. The aircraft is capable of flying between Sydney and New York as well as between London and Adelaide without needing a refuelling stop. The aircraft is also capable of cruising at Mach 0.84 (914 kph), making London to Los Angeles a 9 hour 30 minute journey. One of the most-advertised benefits of business aviation is the ability to land closer to your final destination. This is not always the case for the BBJ 747-8. The weight of the aircraft and the amount of runway needed to operate from (minimum length of 7,500ft) rules out popular airports such as Teterboro and Van Nuys. If you can dream it (and afford it), almost anything can be put in a BBJ 747-8. The cabin has a total area of 5,179 sq.ft3 – a huge amount of space that is configurable however the owner wishes. To put this in perspective, the cabin has a width of 20ft 1in -making it twice as wide as two G650 cabins combined. Typical BBJ 747 cabins are split into a variety of sections including a boardroom, lounge, VIP bedrooms and a staff area. These configurations are mostly dictated by whether the aircraft will be used for government purposes or for UHNWIs. Rendering of Greenpoint Technologies’ Boeing 747-8 main lounge (Image: Greenpoint Technologies). 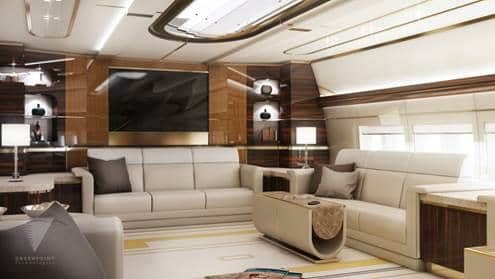 Bizliners work differently to traditional jets when it comes to interiors. OEMs deliver a ‘green’ aircraft to a customer without an interior. The customer then takes the aircraft to one of 15 completion centres licensed by Boeing to design and install the interior. This means that there are no standard interior options or designs – allowing owners and designers to really get creative with the cabin. The interior options and combinations are endless and, as such, can vary wildly between different aircraft and an owner’s personal tastes – something to take note of if you are looking to buy a pre-owned BBJ 747. If you do not like the taste of the previous owner, it is always possible to get the cabin refurbished to your taste – at a cost. As of January 2018, Boeing has delivered 11 BBJ 747-8, with 6 of them currently being in service. The Qatar Amiri Flight and the State of Kuwait both operate the aircraft. The 747-8 has been selected as the replacement aircraft for the 89th Airlift Wing of the United States Air Force – the aircraft America’s president uses – commonly known as Air Force One (although this is the call sign designated to an aircraft only when the president is on board). Naturally, owning and operating a private jumbo jet is not cheap. List price for a new BBJ 747-8 is $367 million – but this cost is only for a ‘green’ aircraft – one without an interior fitted. 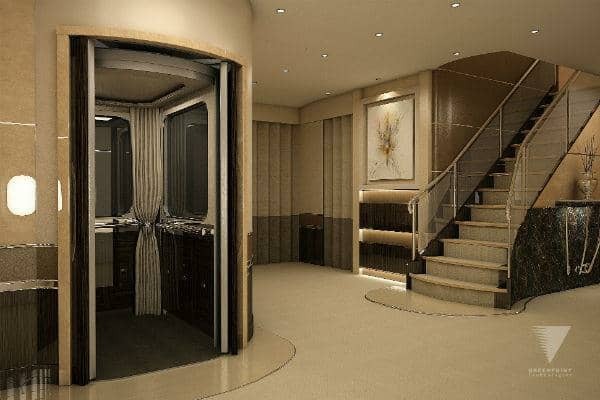 Getting an interior designed and fitted will typically add another $50 million depending on what features are installed and how the interior is designed. The process to install an interior can take up to two years. Operating a BBJ 747-8 will cost an estimated $40,000 an hour – but if you can afford to buy a your own 747, this cost is inconsequential.